Clare Gaynor Willis earned her bachelor’s degree from the University of Illinois at Urbana-Champaign, graduating with University Honors. Clare graduated with High Honors from Chicago-Kent College of Law and was admitted to practice. She served for two years as the law clerk to the Honorable Sophia H. Hall of the Circuit Court of Cook County. 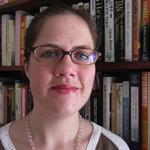 Clare followed her interest in legal research back to the University of Illinois to earn a master’s degree in Library and Information Science. She worked as a Reference Librarian at the law library following graduation, and, in August 2011, she returned to Chicago-Kent as a Research Librarian.